Singer Chris Martin performs a George Michael song on stage at the Brit Awards 2017 in London, Wednesday, Feb. 22, 2017. The Brit Awards recognized big international stars including Drake and Beyonce and a cross-section of home-grown talent Wednesday — but the ceremony was overshadowed by the much-missed David Bowie and George Michael. Bowie, who died in January 2016 at age 69, was crowned British male artist of the year and won British album of the year for "Blackstar," released days before his death. Bowie's son, filmmaker Duncan Jones, accepted the best album award on behalf of his father, who he said had "always been there supporting people who think they're a little bit weird or a little bit strange, a little bit different." "This award is for all the kooks, and all the people who make the kooks," Jones said. "Kooks" is the song Bowie wrote for his son when he was born. As well as rewarding Bowie, the show paid tribute to one of the music industry's many losses of 2016 —George Michael, who died on Christmas Day aged 53. His Wham! bandmate Andrew Ridgeley said that with Michael's death, "a supernova in a firmament of shining stars has been extinguished." 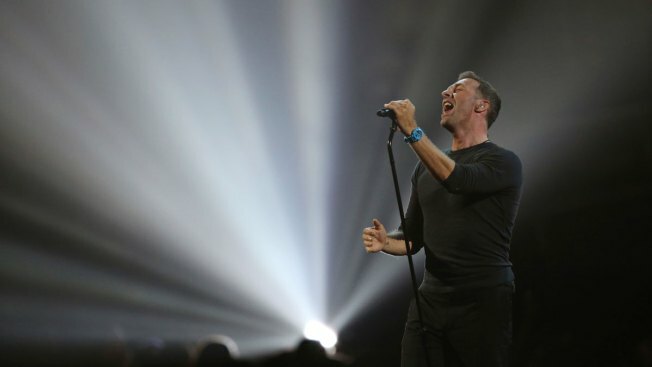 Coldplay singer Chris Martin performed a moving rendition of Michael's "A Different Corner" — dueting with a recording of Michael himself and backed by a group of violins. The flashy show at London 's O2 Arena opened with girl group Little Mix giving a thunderous performance of "Shout Out to My Ex," backed by a troupe of silver-pained dancers. The song went on to be named British single of the year. There were also performances by Bruno Mars, The 1975, Coldplay, Ed Sheeran, Robbie Williams and grime musician Skepta on a night where Britain's music industry celebrated U.K. talent and a smattering of international stars. Singer Matt Healy noted that the band, whose album "I Like It When You Sleep, for You Are So Beautiful Yet So Unaware of It" has been a hit on both sides of the Atlantic, had had the same lineup since the members were 13. Injecting a light note of politics into a show that's often slick and uncontroversial, Healy told entertainers with a platform not to heed advice to "stay in your lane when it comes to social issues." He said that "if you have a platform, don't do that. Please don't do that." She performed "Chained to the Rhythm" — with its references to zombified people "living in a bubble" — accompanied by Skip Marley and a pair of giant skeletons dressed as U.S. President Donald Trump and British Prime Minister Theresa May. The international awards went to global stars — none of whom came to accept them. Drake was named international male solo artist, while Beyonce took the international female prize. A Tribe Called Quest took the trophy for international group. Adele, who took four Grammys last week, was not up for many Brits because her album "25" was eligible last year, and won four Brits. She won this year's Global Success award, which recognizes international sales. Robbie Williams, former member of boyband Take That turned adult pop hitmaker, was given the Brits Icon award. "Oh my days," said the singer, whose real name is Rory Graham. "I'm nearly speechless." Rag 'n' Bone Man beat nominees including the favored grime musician Skepta. Grime artists Stormzy and Kano were also award contenders, reflecting the growing artistic and commercial clout of the distinctly British rap genre. The awards have been accused of failing to represent the industry's ethnic diversity. All last year's British nominees were white, and protesters rallied under the hashtag #britssowhite. This year's list was more diverse, with Sande, soul singer Michael Kiwanuka and singer-songwriter Lianne La Havas among non-white British contenders, along with the three grime performers. "For me personally, when I hear grime, because I'm from London it sounds like London to me," she said. "It does in hindsight feel a bit unusual that it was something that wasn't promoted as much. "But I also think now we've got some real stars happening in that genre, it makes a lot of sense now." Keith Harris, who was appointed to head a diversity taskforce for the British music industry, said "people feel there might actually be a breakthrough." "The question is whether this is going to be long-term or short-term," he said. "That's my concern." Most Brits winners are chosen by music-industry members, with several selected by public vote - including a best video category decided by social-media ballot during the broadcast. It was won, for the fourth year in a row, by One Direction.